The global veterinary antiseptics market is known to have ample players to ensure the competition remains healthy. With new avenues for growth, young companies are expected to expand their global footprints and the future will see new players entering the global veterinary antiseptics market. According to TMRs report, the global veterinary antiseptics market was valued at US$243mn by the end 2015. 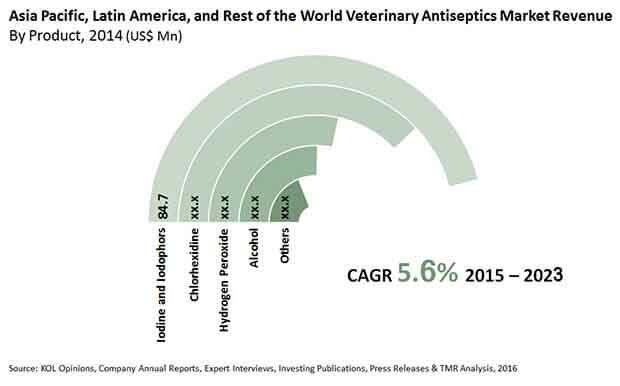 With numerous factors accentuating growth in the coming years, the global veterinary antiseptics market is predicted to attain an overall value of US$401.6mn by the end of 2023. TMR analysts predict that market will climb at a moderate CAGR of 5.6% during the forecast period. When it comes to geography, North America will remain at the helm of the global veterinary antiseptics market. High levels of awareness among people in the region coupled with growing research among companies in the global veterinary antiseptics market is expected to fuel growth here. Over the years, several non-profit organizations have emerged that work towards the welfare of animals. They have aimed at creating awareness among public about the need to care for animals and give them their space for a healthy living. As a result, the importance for maintaining animal health has grown across the world. The realization has trickled down to policy makers, too. These factors have instilled growth in the global veterinary antiseptics market. On the other hand, the number of people willing to pet animals has also risen over the years. This trend is a positive for players in the global veterinary antiseptics market. Further, people are not only considering to have dogs and cats as pets, but, people have also become open to have other animals such as snakes, turtles, birds, and more. This opens new opportunities for players in the global veterinary antiseptics market. Furthermore, the rising consumption of meat across the world is fueling demand among poultry farm owners. With quality a crucial parameter for every person in the food business, poultry farm owners have to ensure that the animals are disease-free and are grown in healthy environments. Hence, the demand for products in the global veterinary antiseptics market is expected to shoot up in the coming years. Some countries have strict regulations pertaining to use of drugs for animals. An example is Japan that has a sharp vigilance over products being sold in the global veterinary antiseptics market. This is considered to hamper growth in the market in the coming years. On the other hand, poor prospects for veterinary doctors in developing nations of Asia Pacific like India and China are also expected to mount pressure among players to sell products. However, growing awareness about animal health and rising number of non-profit organizations in these regions will help manage the situation. It is also predicted that governments in these countries will soon introduce laws favoring animal welfare. This is expected to work in support of players in the global veterinary antiseptics market.